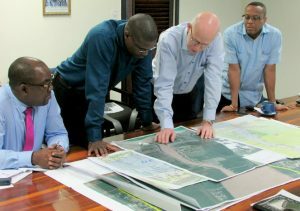 FLASH BACK: Mr. Mol of LievenseCSO Engineering Contracting BV (second right) highlights location info to Minister of Public Infrastructure, David Patterson (second left), then Ministerial Advisor, Mr. Kenneth Jordan (right), and DHBC General Manager, Mr. Rawlston Adams. Minister of Public Infrastructure, David Patterson on Wednesday denied a claim by People’s Progressive Party (PPP) frontbencher, Juan Edghill that GYD$79 million extra was disbursed for a Dutch feasibility study that has been mired in controversy. “What you are saying there is absolutely untruth,” Patterson told the House in rebutting Edghill. The Minister, however, did not go into details about disbursements that Edghill said was made. T he Dutch company, LievenseCSO Engineering Contracting BV, had recommended that government builds a low three-lane bridge with a retraction area to allow ships to pass. Government has since scrapped that plan and has decided to construct a four lane high-span crossing. In the 2019 National Budget, another GYD$100 million have been allocated for a feasibility study. In his contribution to debate on the 2019 National Budget, Edghill called on Patterson to explain how was it that a total of GYD$148 million were paid to the Dutch company, for an unsolicited feasibility study, but figures show that GYD$227 million were paid over by the Demerara Harbour Bridge for that job. Based on a finding by the Public Procurement Commission that Patterson had allegedly breached the Procurement Act and Guyana’s Constitution by sole-sourcing the contract without going through the National Procurement and Tender Administration Board, the PPP has gotten the Guyana Police Force’s Special Organised Crime Unit (SOCU) to conduct an investigation. Patterson has since been questioned by SOCU agents and the matter has gone for legal advice. In the House on Wednesday, Edghill said in the Procurement Commission Report on the issue states that on November 25, 2016 Cabinet approved GYD$161, 514,420 to pay for the study. He highlighted that in December, 2016 the General Manager of the Demerara Harbour Bridge inked a contract without approval of that entity’s board. Edghill claimed that in 2017 the Asphalt Plant of the Demerara Bridge paid GYD$153,250,385 on the feasibility study and in January, 2018 an additional GYD$14,728,000 and in February GYD$59,340,00 was spent on the project. Minister of Public Infrastructure, David Patterson on Wednesday ignored a call by People’s Progressive Party (PPP) frontbencher, Juan Edghill to explain why another GYD$100 million is need for feasibility studies for the proposed new Demerara Harbour Bridge and to account for GYD$79 million related to the first study that has been mired in controversy. In his contribution to debate on the 2019 National Budget, Edghill called on Patterson to explain how was it that a total of GYD$148 million was paid to the Dutch company, LievenseCSO Engineering Contracting BV, for an unsolicited feasibility study, but figures show that GYD$227 million were paid over by the Demerara Harbour Bridge for that job. “We were told that the Dutch company only got 148 million. Where did the rest of the money go? We want to know today, not that we will get the information to you. Get it to us today…even the accounting from the asphalt plant is not accurate. How much did you send? Please tell the Honourable House this afternoon because you asking for another 100 million for the Demerara Harbour Bridge from the budget,” Edghill said. However, when it was the Public Infrastructure Minister’s turn to speak, he merely confirmed that GYD$100 million was indeed set aside for feasibility studies for the new Demerara Harbour Bridge link from Houston, East Bank Demerara to Versailles, West Bank Demerara. Patterson, in his presentation, accused the PPP of executing several multi-million dollar projects totalling US$608 million without feasibility studies. They include the US$200 million Skeldon Sugar Factory, US$138 million Cheddi Jagan International Airport renovations, the Specialty Hospital, the Lethem-Linden fibre-optic cable, East Bank – East Coast bypass road, Berbice Bridge, and the Amaila Falls Road.